Support for documentary editions can take many forms. If you find the work of the John Jay Papers useful, please take the time to let us know. Please also inform our major sponsor, the National Historical Publications and Records Commission, which shapes its policies based on the known needs and interests of scholars, writers, teachers, students, and the general public. Let the NHPRC know how valuable these editions are. The John Jay project seeks to make its archive as complete as possible. 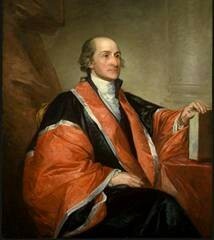 The project is always searching for additional documents on John Jay and his family. Should you have such manuscripts in your collection or know of some in obscure and little known places, please tell us so that we may arrange to obtain digital images or photocopies. The John Jay project must be supported primarily by grants and individual donations. Our ability to complete our work depends on the generosity of our supporters. Donations to the Selected Papers of John Jay are tax deductible. Checks should be made out to Columbia University, with a notation or letter indicating it is intended for the support of the Selected Papers of John Jay project.